We worship God together every Sunday at 10 am and 5 pm. We also come together for worship on Christmas Day, New Year’s Eve, Good Friday and Ascension Thursday. Please contact the Pastor for times and details. Our worship services are open to anyone who wants to worship with us. So please come and join us. God has ordained the Sabbath as a day of rest and worship. We come together twice on the Lord’s Day to worship and praise God for the great salvation we have in Christ. 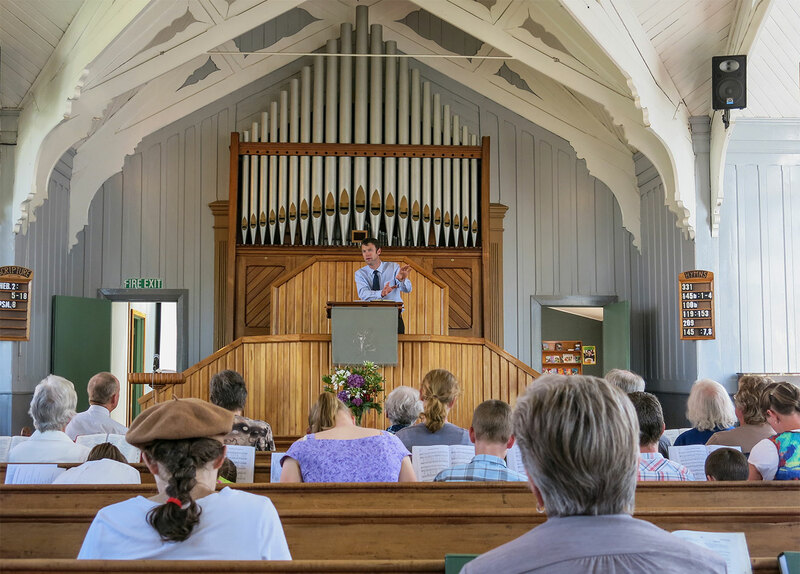 We understand that it might be a little strange in our culture to worship together twice on a Lord’s Day, but apart from the fact that it has a long history and strong Biblical warrant we see the necessity for us to grow together in God’s Word more and more as our culture drifts further away from that word. Feel free to come as you are. You will find members wearing anything from casual wear to suits and ties. Do you have something for my children? There is Sunday School class after the morning worship service. If you come with very young children, we have a crèche during the service. How do you do worship? We know that visiting a new church can be embarrassing or uncomfortable. It is hard to know what will happen when – especially when most of the people there know exactly what is going on. New songs and new ways of doing things can seem strange. Worship is governed by what God has revealed about himself in His Word. An addition to this is that worship is to be according to what he has prescribed as acceptable worship. Worship is a dialogue between God and his covenant people – worship is a communication. In this communication God speaks to us through his Word and we respond to him, either in prayer or in song. Every part of worship must have a biblical reason and a biblical defence. The elders supervise and are responsible for every aspect of our worship service. So though the pastor, or one of the other elders, leads us in worship, it is under the authority of the elders. The songs we sing are chosen primarily for their theological or biblical accuracy. Biblical worship is aware of the importance of music to God, and has always appreciated melody, harmony and rhythm. But all of that is secondary to a higher, primary concern: faithfulness to Scripture. Our songs are intended to complement, support and apply the theme of the message. Call to Worship: The Lord officially summons us to worship him. This is usually done with the reading of an appropriate Scripture passage. Song of Adoration: We respond to God’s call to worship and his welcome by praising him. Reading of the Law: God’s law functions in two different ways in our worship: either as a teacher of sin that drives us to Christ, or as a guide to living the thankful Christian life. Prayer or Song of Confession: Being aware of our sinfulness in God’s holy presence we confess our sins to God and plead for his mercy in Christ. Assurance of Pardon: The Lord responds to our confession and penitence, with the assurance that our sins are forgiven in Christ alone, wholly by grace, received by faith alone. Congregational Prayer: Here, the minister addresses the Lord with the petitions of the congregation. Prayer is often composed of Adoration, Confession, Thanksgiving and Supplication (ACTS). Offering: In response to God’s great mercy in Christ we make an offering to the Lord. Song of Preparation: This song prepares us to hear the Word of God. Song of Response: We respond to the Word with appropriate singing, again emphasising the theme of the sermon. Benediction: The Lord dismisses us with his blessing. Doxology: This is a song in which we celebrate the glory and supreme majesty of God, while accentuating our complete dependence on Him and His goodness to us. Here is a video of one of our worship services.